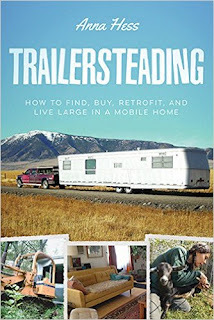 It was just about exactly two years ago that I reviewed Anna Hess's book, Trailersteading here. My review morphed into a rant on the subject of trailers and people who live in them. If you have not read that blog, I recommend it to you: Trailersteading: A Book Review And A Rant. I really like Trailersteading because it's all about saving money (a LOT of money) on housing, and not going into debt, or not going deep into debt for a long period of time. The fact is, a great many Americans live in housing that is well beyond their means. They submit to debt slavery for decades, and pay an amazing amount of money in the form of interest to banks for the mortgage money they borrow (and, as I've discussed previously, those banks don't toil, and sweat and sacrifice for the money they lend, like you will to do to pay it back). As far as I'm concerned, having a long-term mortgage is fiscal foolishness, especially in the times we now live in. Mortgages presuppose that the future will be like the present, that the person who gets the mortgage will always have work and a steady income. But, as we all know, life doesn't always play out that way. I think a home should be a place where a family can have a measure of security and stability. If your home is mortgaged to a bank and dependent on you earning a steady income to pay the mortgage, you don't have security and stability. This is common sense, right? Trailersteading is one viable solution to the affordable home conundrum. But the problem is, of course, that most Americans are too proud to live in an inexpensive old trailer. They'd rather be a slave to debt so they don't appear to be as poor as they really are. The fact is, if you want to have an inexpensive home, preferably on a section of rural land (which I explain the wisdom of HERE), in order to live a more secure and self reliant lifestyle, a used trailer makes a lot of sense. Then, with the money you save (part of which would be all that money you would otherwise be paying in interest to a bank) you can someday build the home of your dreams. In other words, trailersteading can be pursued as a wise first step in a long-range plan. That said, Trailersteading is a book of hope and solutions. I see it as a book that should be on every thoughtful agrarian's bookshelf—if not for yourself, than to lend to someone who could benefit from the practical perspective. If you go to Amazon, check out the "Look Inside The Book" feature. That'll give you a much better idea what Trailersteading is all about. The Trailersteading link I provided yesterday to Amazon was incorrect. It went to a page where the book was way overpriced and you couldn't "Look inside the book." The link now works as it should. The book is currently priced at $`11.38 (free shipping with Prime). It's a good value.